Slider is a very common element of websites and can be used to great effect. Implementing this element in your site will definitely count as a big plus. It does a great job of making your pages look livelier and attracts much needed attention to the content you want to get to your customers. With this element aside from plain static images you are able to animate the slideshow content from the text content to multiple images appearance on the slide. You are offered lots of useful customization options in this section. 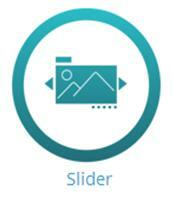 We provided you an opportunity to select whether you want to show slider on inner pages or not. There is a special option to hide slideshow on inner page if it is necessary. Customizing speed and delay for changing slides, you should specify the values, that can be estimated as sufficient time for reviewing the slides before the change. Besides, there is the complete set of beautiful panning slider effects in the last option of this section. You can find out how to customize this element on the page Slider.